The verdict is out whether Samsung has done just enough to extinguish the fiery memories of August and September 2016. 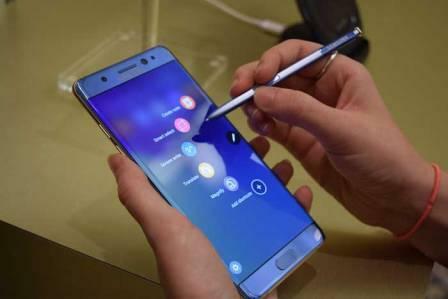 The South Korean tech bellwether on Wednesday unveiled the highly-anticipated Galaxy Note 8, the successor to the ill-fated Note 7, which was infamously killed off because they were fire-prone. Ten months after that debacle, Samsung hopes to banish those demons, which cost the company huge losses and unprecedented embarrassment. "I remember what happened [with the Note 7]. and I will never forget the Note loyalists who stuck with us," D.J. Koh, Samsung's president of mobile communications, said at the Unpacked 2017 event in New York City, which started at 7pm UAE time. "We are here today because of your support," he added, after a video of sympathetic Samsung users was played before the audience. While the Note 8 is indeed Samsung's largest device to date, at 6.3-inch Super Amoled screen it is a mere 0.1 inch larger than the recently-launched Galaxy S8 Plus. The new phablet, though, has the Infinity Display, which was first introduced in the S8 series and was well-received as it stretched the screen's limits, providing more space to view content and multitask more seamlessly. Possibly the Note 8's biggest feature is its new dual-camera system - one wide-angle and one telephoto, similar to those that have been used in other smartphones such as Apple's iPhone 7 - which is also the world's first smartphone to have optical image stabilisation on both lenses, which contributes to better video. Samsung also touted its camera system's improved performance in low-light situations. The S Pen - the Note series' signature accessory - was also souped up with new features, such as "Live Messages", which can animate messages, plus a function that allows users to translate languages or convert currencies. Bixby, Samsung's digital assistant akin to Apple's Siri and Google Assistant, has also been upgraded, with more tasks accomplished with less words spoken to it. The company also announced that Bixby is now available in English in more than 200 markets, and that it "continues to learn", a nod to Samsung's further push into artificial intelligence. The Note 8 also remains IP68-rated, meaning it can withstand dust and water up to 1.5 metres and up to 30 minutes. And aside from Samsung's own mobile security platform, Knox, the device's security options include PIN, pattern, password, fingerprint scanning, face detection and iris scanning. It also comes with 6GB of RAM - 50 per cent more than the Note 7's 4GB - though its storage remains at 64GB and still comes with a microSD slot. As an added bonus, each device will ship with premium AKG headphones, which can be connected using a 3.5mm audio jack. Samsung announced that pre-orders for the Galaxy Note 8 will begin "in a few days", and will be available on September 15. Though no price was announced, rumours are swirling that it could top the $1,000 (Dh3,673) mark, similar to what is being pegged for the next iPhone. Unconfirmed reports say that it will be sold for £869 ($1,110, Dh4,100), though Koh, in an interview with CNBC, said: "the basic price. I do not want to see it at $1,000".